We're already halfway through February and the snow continues. When is winter ever going to end?! I suppose being cooped up at home has it's perks. One of them includes being surrounded by loved ones over a comforting meal! This past weekend, we had a post Valentine's Day luncheon with both my parents and The Baron's parents where we all enjoyed a feast of Filipino dishes. I'll be sharing the recipes that were prepared all this week so stay tuned! 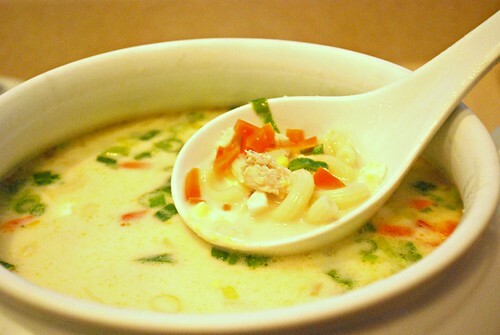 For our starter course, we warmed up to this Creamy Chicken Macaroni Soup. 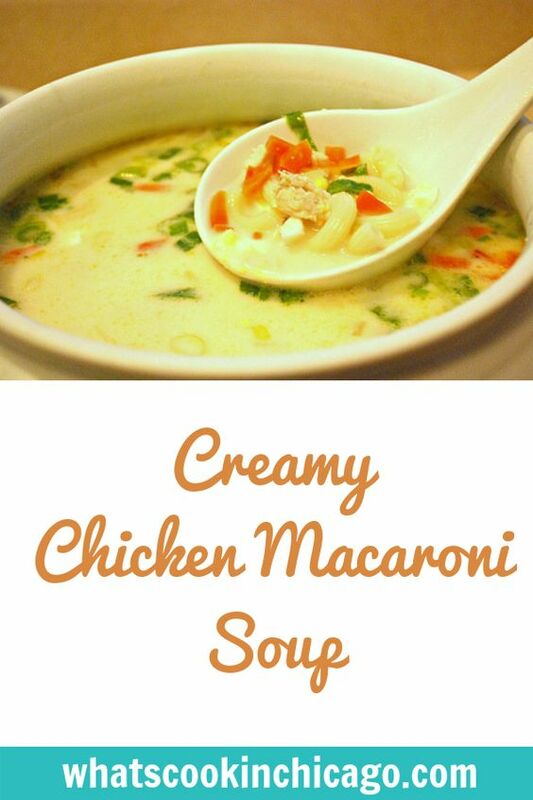 This is more fondly known as Filipino Sopas where macaroni noodles, chicken breast, and a melange of aromatic vegetables simmer in a creamy chicken broth before garnishing with chopped egg and green onions. In a dutch oven set over medium high heat, melt butter. Add garlic and onion, sautéeing until softened. Once softened add the bell pepper and carrot, cooking until slightly softened, about 3-5 minutes. Add the chicken broth and salt and pepper to taste. Stir to combine. Add the cooked macaroni, shredded cooked chicken and evaporated milk. Stir and simmer for 10 minutes until warmed through. Just before serving, stir in hard boiled eggs. Serve and garnish with green onion. Love the creaminess of this soup. Soup always feels more luxurious when it is creamy. It's perfect for these cold winter nights. Who knows when this cold will end, in the mean time at least we have your soup to warm up with! Creamy and definitely dreamy. I'd love to slurp a giant bowl of this in front of the fire. I am always looking for a good soup recipe!